An opportunity to study in Paris is on the horizon for Morehouse College debate team members Jonathan Carlisle and Keith Matier after their victory at the North American Championships of the Lafayette Debates. Along with a duo from Yale, Carlisle and Matier will participate this summer in the 2017 Young Ambassadors Study Tour. Neither young man had experience in debate before joining the team as freshmen, and now they’re preparing to study and debate across the world. Morehouse speech and debate director Kenneth Newby and his team gather on the second floor at Brawley Hall and put the work in, similar to a football team on the practice field. “Debate is intellectual sport,” said Newby. “It will be an honor to be representing Morehouse College in Paris,” said Carlisle. 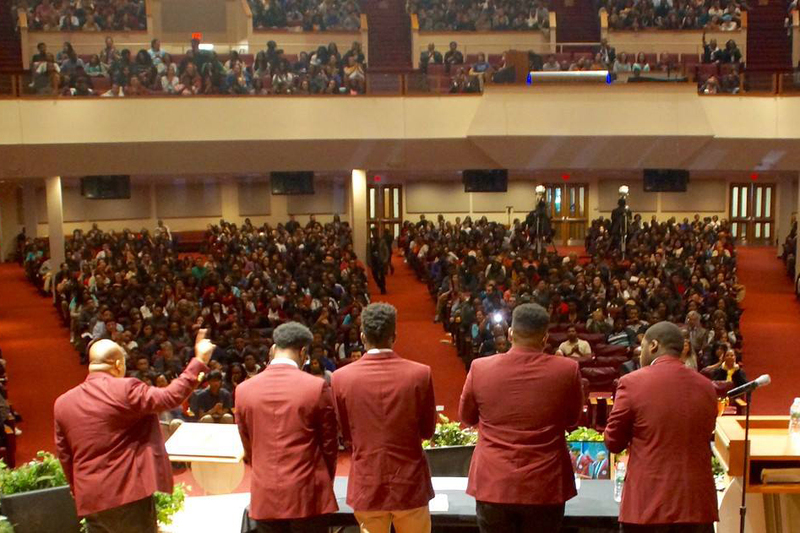 “It feels great because it vivifies our academic experience here at Morehouse,” said Matier. Collegiate debate teams from all over the United States and Canada were invited to compete at the North American Championships of the Lafayette Debates held at La Maison Francaise, the French Embassy in Washington, D.C., on April 8 and 9. There were small schools such as Belmont Abbey College; large schools such as Clemson University, the University of Pittsburgh and the University of Texas; and Ivy League schools such as the University of Pennsylvania and Yale University. Morehouse was the lone historically black college and university. In the finals, Morehouse competed against Vanderbilt University. Their topic was “Should democracies prioritize interculturalization as a strategy for managing diversity?” The topic fell in line with the level of discussion Newby and his team of 30 debaters work on during practice. What does it take to be a great debater? According to Newby, Carlisle and Matier are two of his best and most trusted students and debaters. “Those are the type of students that the speech and debate program produces,” said Newby, who also mentioned senior team captain Da’Von Boyd as another one of his charges who has excelled this season. Boyd has been accepted to Yale’s political science doctoral program. The team’s accomplishment in D.C. is the latest in a string of national and international debate championships won by Morehouse under the direction of Newby. The director of the debate and speech program since 2011, Newby, a competitive debater himself, and the Morehouse debate team are putting together a string of victories that would make any institution envious. Before the Lafayette Debates, Morehouse has been impressive this year, losing in the finals at the Pi Kappa Delta Nationals, the oldest national forensic debate tournament in the country, in both the varsity and junior varsity divisions, which were hosted by Boise State University. Last week, Newby and sophomore Shaheed Brooks teamed up to win the 2017 North American Debate Cup. The one-day competition is open to all debaters with affiliations to collegiate programs. Newby and Brooks brought the America’s Cup back to Morehouse for a second consecutive year. Morehouse hosted the first annual Morehouse Justice Debates, a civic debate started by Newby and designed to be friendly to the public in hopes of sparking civic debate that both the skilled and novice debater can understand. “We brought social justice workers to judge the debates, lawyers, activists in the city that are really working in the trenches,” Newby said. Debate teams from George Washington University, Cornell University and neighboring Clark Atlanta University, to name a few, participated in the Justice Debates competition that was ultimately won by Brooks and junior teammate Mati Baker for Morehouse. Newby was recognized as the 2016 Morehouse College Alumnus of the Year and is working with the Spelman College debate team, free of charge, to help further develop their competitive skills. In February, they returned from the Mardi Gras Classic debate tournament at Tulane University in New Orleans, where Spelman’s team won the novice division title. Morehouse won, too. The Maroon Tigers took home the varsity title.